Buy 3 get 1 free of charge. To receive your free stock please download and complete this form and send with your signed CD requisition for to your wholesaler. *Terms and conditions: To receive your free vials please send this form, along with your CD requisition form, to your wholesaler. The offer is not available in combination with any rebate or discount schemes that are in place or may be introduced in future. Methadyne is a controlled drug schedule 2 and as such orders must be accompanied by a signed CD Requisition Form which the practice should send to their wholesaler. Free stock will be sent via your usual wholesaler with your usual delivery. If Methadyne is returned to the wholesaler for any reason, the free stock must also be returned. Offer valid for a limited time. 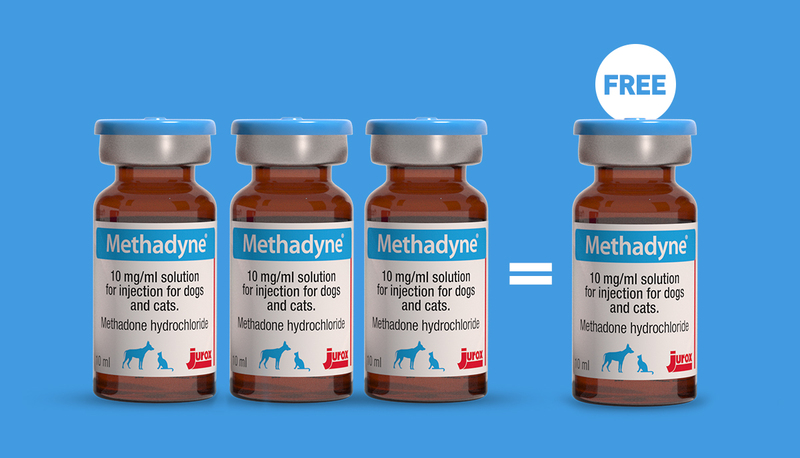 Methadyne® contains Methadone 10mg/ml. Legal category POM-V CD Sch 2. Methadyne® are trademarks of Jurox Pty Limited, Rutherford, NSW 2320, Australia. Further information is available on request from Jurox (UK) Private Limited Company, Richmond House, Second Floor, 105 High Street, Crawley, West Sussex, RH10 1DD. Tel 01293 510681. ® Registered trademark of Jurox Pty Limited. Copyright © Jurox Pty Limited 2018.